World-class in aggressive applications and general vacuum applications. Industry leading in cost of ownership in both air-cooled and water-cooled pumps, with minimum power consumption, minimum purge requirements and minimum water usage. They are very compact, quiet, and have state-of-the-art network, control and feedback capabilities. Regardless of the process or the platform, Kashiyama Vacuum has a world class pump that will meet your needs. Kashiyama’s complete line of vacuum pumps cover the entire spectrum of applications found in the most aggressive FPD, 300mm, 200mm, and 150mm applications and are tailored for semiconductor, LED, OLED, and FPD processes. 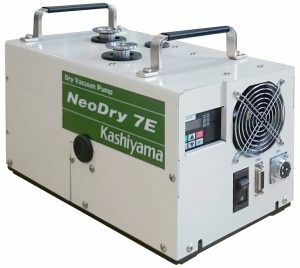 The NeoDry series leads the industry in its class of air-cooled multilobe pumps. Six models provide from 110 LPM (~ 4 CFM) to 1,666 LPM (~ 60 CFM) with base pressures at 7.5 milliTorr. They have a 2-year warranty and a ~7-year meantime between rebuilds. They handle up to 600 grams per hour of condensable vapor and are an excellent choice for replacing scroll pumps and other lesser performing multilobe pumps. Six models provide from 1660 LPM (~ 60 CFM) to 30,000 LPM (~1,060 CFM) with base pressures at 11 milliTorr to 3 milliTorr. They have a 2-year warranty and a ~3-5-year meantime between rebuilds. They are industry leading in low power consumption and have a small footprint. Six models provide from 1660 LPM (~ 60 CFM) to 30,000 LPM (~1,060 CFM) with base pressures at 37 milliTorr to 3 milliTorr. They have a combination of chemical resistant seals and hot N2 purge to enhance process durability. They provide a 2-year warranty and a ~3-year meantime between rebuilds. The SDE series is well suited for all FPD, 300mm, and 200mm applications by supporting high-particulate loads, aggressive chemistries, and high-process gas flows. All SDE series pumps can be combined with VFD-driven mechanical boosters for higher pumping speeds, lower vacuum pressures, and energy management benefits. SDE standard pumps are 2 and 3-stage units supporting typical harsh processes. Pumping speeds are from 20,000 LPM (700 CFM) to 190,000 LPM (6,700 CFM). SDE-X pumps focus on high efficiency and low power consumption in the 1300 LPM (~50 CFM) to 45,000 LPM (~160 CFM) flow range. The top of the line SDE-TX pumps support processes such as Metal Etch, SA-CVD, Metal-CVD, PE-CVD, LP-CVD, and ALD. They have a flow range from 1,500 LPM (~ 53 CFM) to 45,000 LPM (~ 1,600 CFM). SDL pumps are highly suited for large wafer, FPD, coating and general vacuum where fast cycle times and high gas flows are needed on large volume chambers. Seven models provide pumping speed from 25,000 LPM (~ 890 CFM) to 190,000 LPM (~6,700 CFM) with base pressures at 37 milliTorr to 3 milliTorr.